Recently there have been several incidents of Molotov cocktails thrown at African homes and businesses in Tel Aviv, and 11 young people were arrested for attacking refugees with clubs. This follows a vicious multi-year campaign by the government demonizing African asylum seekers that I described in a previous blog post on March 10. Unfortunately, this type of vigilante violence is becoming pervasive in the West Bank as well. Jewish settler violence against Palestinians is skyrocketing and becoming routine. They act with impunity as few ever get prosecuted. This week settlers were caught on video shooting Palestinians while nearby Israeli soldiers passively looked on and did nothing to stop them. To understand what it is like to be in the middle of the violent passions being stirred up, read this column from Haaretz reporter Ilan Lior for an eyewitness account of what it was like to be caught in the Tel Aviv riot. It started as a legitimate protest, and then it went out of control. The masses understood the message: the time for talking is over – it’s now time to act. I have been a journalist for ten years. I’ve covered terror attacks, funerals, car accidents, and protests. I’ve seen fury, frustration, despair, and sadness in a variety of places and forms. But I’ve never seen such hatred as it was displayed on Wednesday night in the Hatikva neighborhood. If it weren’t for the police presence, it would have ended in lynching. I have no doubt. Perhaps a migrant worker would have been murdered, perhaps an asylum seeker, or maybe just a passerby in the wrong place at the wrong time. It started as a legitimate protest. South Tel Aviv residents objected to the government’s policy, or more accurately, the government’s lack of policy. Over the course of a few years, tens of thousands of Africans have made their way into the neighborhoods of south Tel Aviv. Residents call them infiltrators, others call them refugees or asylum seekers. The Africans have made life in south Tel Aviv hellish, according to the residents. A demonstration of hatred took place on the stage. One after another, residents took the stage to tell horror stories of violence perpetrated by the infiltrators. Some called for extreme action and even violence. “Bibi, I’m taking the law into my own hands,” warned one of the residents. Protest organizers, among them a city councilman, Shlomo Maslawi, attempted to tone it down and calm the crowd. We must not turn to violence, they said. The Knesset members were not interested. Believe it or not, they fanned the flames. “The Sudanese are a cancer in our body,” said Miri Regev, (Likud). “All the left-wingers that filed petitions in the Supreme court should be embarrassed – they stopped the expulsion,” she added. Michael Ben Ari joined in on her incitement. “There are rapists and harassers here. The time for talk is over,” said Ben Ari (National Union), exciting the crowd. He also pointed a finger of blame at the left-wingers, and “tzfonbonim” (Israeli slang for affluent, stuck-up residents of north Tel Aviv). Regev and Ben Ari did their part. The protest went out of control. The masses understood the message: Talk is over, it’s time to act. Now is the time to take the law in to our own hands, to get violent, to release our rage. Some members of the migrant community passed by, scared, while others say they were afraid to leave their houses. The protesters, they believed, are just waiting for the right time to strike. Just moments after Ben Ari’s speech, I found myself in a surreal situation. “You’re a left-winger that throws rocks at soldiers at checkpoints,” one protester called at me. “You’re a traitor, we’ll finish you,” threatened another. I tried to explain that I was a journalist, and not a left-wing activist, that I’ve never protested at checkpoints, nor thrown a rock at anyone. I told them that I came to give a voice to the residents’ calls, to their struggles, and to pass the message on to those who make decisions. No one listened. The situation started to deteriorate very quickly. The threats became more intense, hands were thrown in the air, one of the protesters pushed me, another snatched my notepad and threw it in the air. “You’re making a mistake,” I said, desperately trying to stop the carnage. Border Patrol officers saved me, escorting me off to the side. “I recognize you. I’m a bus driver. I saw you throw rocks at soldiers at a checkpoint last week,” said one woman, running amok. “You’re mistaken, they’re deceiving you,” I answered. “I’ll get you,” she threatened, in front of the uniformed officers. A short time after, she was joined by another protester, then another, then another. The officers decided they needed to get me out of there, and fast. They began to push me down Hahagana street. “Faster, they’ll murder you,” the frightened officers told me. I looked behind me. Hundreds of people had begun to chase me. It was clear to me that the small police presence would not be able to deal with the masses. Some of them caught up. One grabbed my shirt, and ripped it, while threatening to murder me. For the first time, I saw true hatred in the eyes of another person. The officers pushed me into a patrol car, in an attempt to protect me. The patrol car became the center of the chaos. The masses surrounded it, protesters banged on the doors and windows, rocked the car from side to side. “Traitor,” they yelled. The hardship of south Tel Aviv residents is real. No one denies that. These are weak neighborhoods, forced to take on a population with nothing, engaged in a daily struggle for survival. But that’s only part of the story. On Wednesday, everyone with black skin was labeled an enemy. These Knesset members are largely responsible for turning the words into acts. They cannot shake off that responsibility. The harsh violence against passersby that happened to have black skin is a direct result of their wild incitements. The incitements on Wednesday are the start of a slippery slope. It is best to stop it as early as possible. If the public leaders and neighborhood officials won’t take responsibility, someone could pay with their life. The writing is on the wall, in black and white. There was lots of interesting news during the past several days while I took a short vacation to drive through the Galilee where, after this winter’s torrential rains, yellow and blue wildflowers cover the hillsides and some areas resemble the dark, green woods of New England. So here are three items that make for interesting reading. This is good news if you care about the rule of law in Israel and the importance of enforcing Supreme Court decisions. In 2006 the court ordered that the illegal settlement of Migron be evacuated and the land be returned to its rightful Palestinian owners. This was followed by 6 years of delays and government inaction. Recently, an agreement was reached between the government and the settlers, without consulting the Palestinian landowners, that would have delayed the evacuation until 2015. Yesterday, the Supreme Court rejected this agreement and unanimously ordered that Migron be demolished by August 1st. Click here for key excerpts from the justices’ decision. Despite settler claims to the contrary, Migron was a clear-cut case. Here is a 2008 article describing an Associated Press investigation of the settlers’ claims of ownership. One of the documents presented to the court was a bill of sale by a Palestinian farmer, Abdel Latif Sumarin, that was signed and notarized in 2004. Unfortunately for the settlers, Mr. Sumarin had died over forty years earlier in 1961. The notary, who is based in California where the fictitious sale was purported to have occurred, also declared his signature was fraudulent. See the article for more details. “Itay Harel, a social worker who lives on the Sumarin plot in Migron, insisted the sale was legitimate, although he refused to discuss it in detail. He also made clear that from the settlers’ perspective, the sale was beside the point. ‘This land belongs to the people of Israel, who were driven off it by force,’ Harel said, referring to the defeat and exile of the Jews by Rome in A.D. 70. He said no Palestinian had a rightful claim to any part of the West Bank. Israeli Politicians and defense officials are scrambling to figure out where to move the settlers and how to avoid a violent confrontation with their supporters. Even worse for the government, this might open the door to many other court decisions that settlements have been built on privately owned Palestinian land and must be evacuated. We can expect that the Knesset will attempt to address this issue. 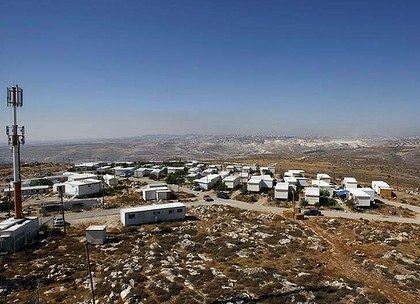 Today’s newspaper reported that already there are bills under consideration that stipulate “if a community [Jewish settlement] is erected on private land in good faith, after a certain number of years the rightful owner cannot evict residents but can demand compensation.” So far these bills have been blocked but Migron is a game changer. One week ago 300 fans of the Beitar Jerusalem soccer team descended on the Malha Shopping Mall in Jerusalem to celebrate the team’s victory in a game. They stood on tables and chairs, screaming “Death to the Arabs” and then proceeded to attack the Arab workers in the mall. As one shop owner said, “…they beat the hell out of them.” Arabs were hurled into shops, smashed against plate glass store windows, and chased up and down the escalators. The entire riot was captured on the closed circuit video cameras in the mall. A very large contingent of police eventually arrived 40 minutes later and cleared the mall. Then nothing was done. No one was arrested or prosecuted despite the video evidence. The media ignored the incident until the Haaretz newspaper broke the story five days later last Friday. Click here for more details. 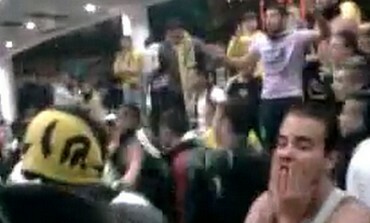 A frame of Beitar fans in the Malha Shopping Mall taken from a video clip. Over the weekend, the police were scrambling to do damage control, claiming there will be a thorough investigation and that the perpetrators will be prosecuted. One can only imagine the police and media response if 300 Arabs had invaded a shopping mall and then chased and beat Jewish workers. The problem is that the lack of police follow-up is not unique. I documented a long history of police ignoring violence against Arabs in East Jerusalem in a February blog post. The situation is especially egregious in the West Bank. The human rights NGO Yesh Din reported that over 90% of police investigations into settler violence against Palestinians resulted in no indictments (97% resulted in no indictments if the crime was limited to destruction of Palestinian property). Even worse, as I reported in the February blog post about East Jerusalem, it is often the Palestinians themselves who are arrested if they file complaints. Click here for an example. Here is a thought-provoking article which argues that the political status quo of the West Bank occupation is a rational choice that the Israeli public has chosen, given today’s environment. The article offers an intriguing explanation for why the Likud and Netanyahu are so popular right now, despite polls that show many Israelis would like to end the occupation. This past weekend there were two things I encountered that gave me hope – hope for the future of a peaceful Middle East. The reporter interviewed Dror Bondi, a teacher at a Hesder Yeshiva in the West Bank (students at a Hesder Yeshiva combine army service with Torah study). Surprisingly, Heschel is not well-known in Israel and is seldom studied. Bondi’s mission is to change that. Bondi also reminded me of the Shalom Hartman Institute in Jerusalem, another beacon of hope in the Orthodox landscape here (see my December 23, 2011 post). Although both are in the distinct minority, perhaps a time will come when they will change the conversation in the Orthodox Jewish community. For those who are Jewish educators interested in re-framing the conversation about Israel within a religious context, Rabbis for Human Rights, with branches in both Israel and North America, also has material to assist with this. 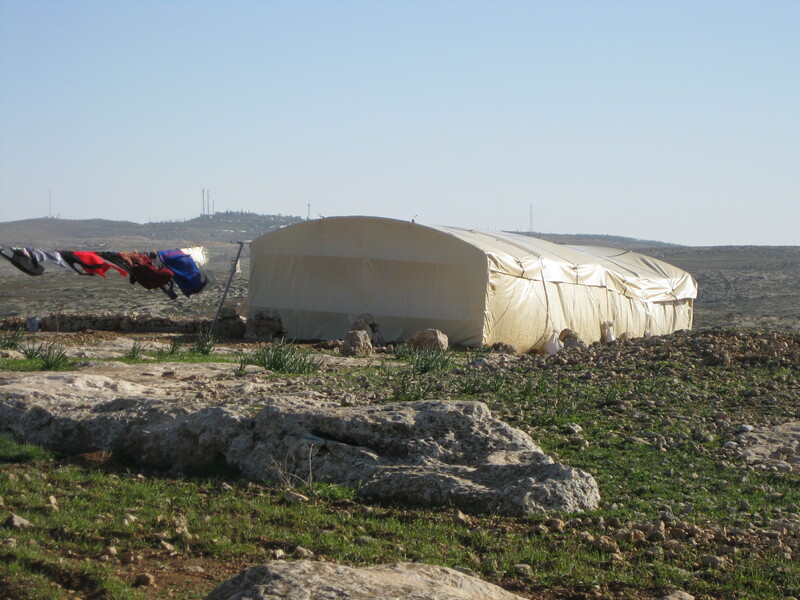 Palestinian farmer's home in Susya. The families live in tents because their dwellings are slated for demolition by the government. But that is not why I am writing this post – although the courage and tenacity of those farmers is inspiring and heartbreaking at the same time. Rather, I am writing to tell you about Combatants for Peace (see http://cfpeace.org/), an organization composed of former Israeli soldiers and Palestinian fighters, individuals who had fought but now work for peace, non-violence, and an end to the occupation. They have about 200 active members who belong to five regional groups, each one pairing an Israeli city with a Palestinian city, for example, Tel Aviv and Nablus. Each group meets monthly in the Palestinian cities (the Palestinian members cannot enter Israel) to plan activities, tours for the public, and events. To give you an idea of how and why these former fighters became involved in this organization, the following links are brief life stories of two members of the group, one Palestinian and one Israeli. They illustrate how this conflict has deep and long roots on both sides but how reconciliation can emerge. Both accounts are very moving and provide the kind of insight into the occupation that only personal testimony can do. Combatants for Peace organized the bus from Tel Aviv that took me to Susya. All 50 seats were taken, many by former Israeli soldiers who were devoting the day to show solidarity with the farmers in the Hebron Hills. We were all instructed to remain non-violent and passive if the nearby settlers come to harass and attack. We spent the afternoon at a newly built school that serves 35 children, grades one through four. For much of the last decade, children did not attend school because road closures made it impossible. A few years ago the community set up tents for a school. When a powerful storm blew the tents away they built the new concrete structure. Since there is no electric power or water hookups provided to Palestinians, the school uses solar power and water is trucked in. Until recently there were no bathrooms at the school. Of course, since Palestinians in this area cannot obtain building permits, the school already has been served with a demolition order from the government – just like all the Palestinian dwellings in the area. One day a bulldozer will show up unannounced, accompanied by soldiers. It will quickly reduce the school to a pile of rubble, perhaps along with some Palestinian tents in the area. (The farmers live in tents which are easier to reconstruct than buildings after they are demolished.) Such is life for the residents of Susya. 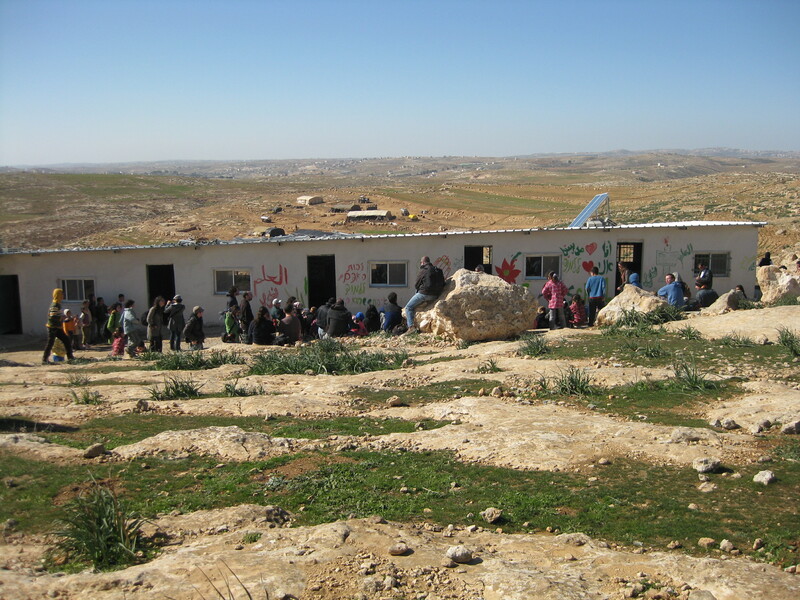 The new school in Susya. Note the solar panel on the roof that provides electricity. The building will be demolished by the army at some point. But on this weekend Israelis and Palestinians celebrated the school by planting sabra cacti on the hillside in front of the school building. It was a fitting symbol. The school’s principal mentioned in his welcoming remarks that the sabra is historically emblematic for both Israelis and Palestinians – another thing we could fight over if we chose to. But the truth is, just as we are all visitors on this earth, so too with the sabra in Israel and Palestine. It turns out it is a native plant of Mexico and was introduced to the Middle East only during the Ottoman Empire. So much for historical myths! 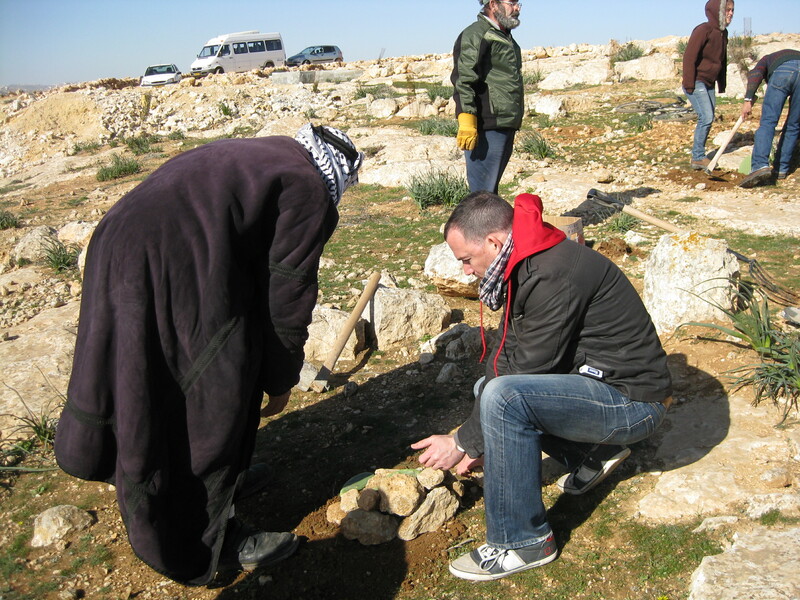 Local Palestinians and Combatants for Peace planting sabra cacti on the hill overlooking the new school.